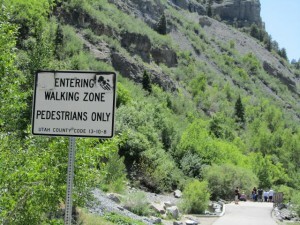 Provo River Trail Closing to Bikes? Ever since the Daily Herald article about the potential of bicycles (and long boarders) being banned on the PRT hit press our email has been blowing up, and rightfully so. For those of you who have not read the article make sure to click the link and read it in full. The short of it is there have been concerns that bicyclists (and long boarders) are too dangerous in certain parts of the trail, and the County is considering turning those points of concern into walk only areas (this is not a new concern). We have done some digging and have found out a few more facts but first we need to clear up the one thing that bugged me the most about this new information. The thing that disturbed me most from this article was not this continuing concern and conversation, but instead what seemed to be the uncharacteristic comments that were made by John Hales from Boards of Provo. After making a quick call over to BOP John cleared everything up, and let me know that he is all for bikes (he even owns a few himself). His comments were directed specifically at those who are using the trail, ‘as their own personal velodrome/raceway.’ So, if you read this article and were a little confused and angry like I was let it be known that John is a great guy who is all about everyone (biker, boarder, ped), using and enjoying the trail as long as they are being responsible. We could not agree with him more! Now on to some of the facts. What the article does not tell you is that the County is only looking at one point in particular. The area they are eyeing for a potential ban is the part of the trail which runs parallel to the campgrounds that are just West of Nuns Park. This area of the trail is very similar to the pedestrian only zone that now exists at Bridal Veil Falls, it is filled with people on the trail who are accessing one very particular destination, and are usually only on the trail because their destination happens to lie on it. The good news about this whole concern is our wonderful City Council, Mayor’s Office, and Bicycle Committee have already sprung into action to work with the County office so that all trail users can have an enjoyable, and safe experience. We will keep you updated on all the details as they unfold, but until then wether you are walking, riding, or boarding lets all be a little more mindful. Also, a big thanks to BOP for being willing to answer our questions, and for being such an awesome part of our community. Have you seen the bike-themed street art appearing on Provo’s tired-looking walls and utility containers. It’s pretty amazing. 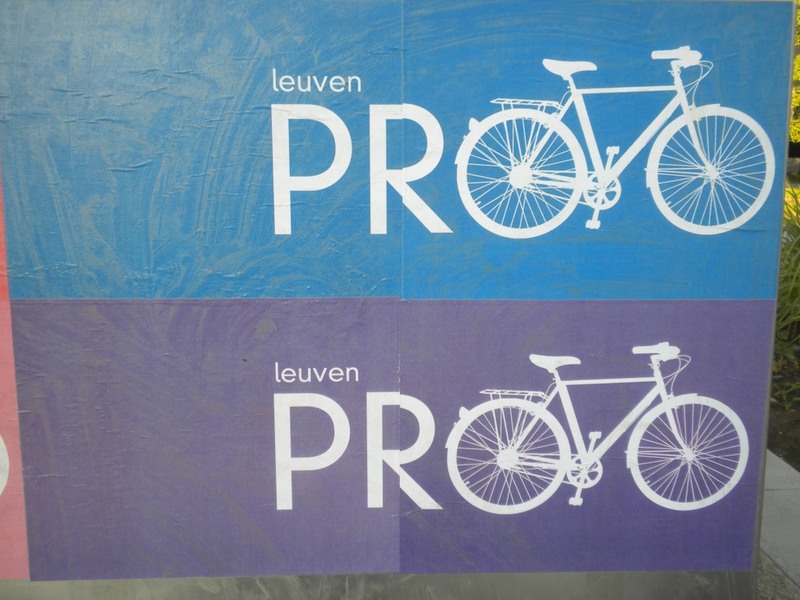 Apparently, the bike art is the creation of a local street artist that goes by Leuven. Thanks to Jim over at Provocation for the heads up and the pic. 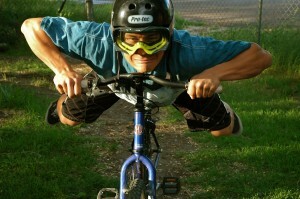 Check out his blog to see more bike art photos and learn where to find them. I vote we make this the new city logo. Ever been riding your bike and wondered if you could take the lane on a particular road, or if the car that just buzzed you could get in trouble for passing too closely? Well guess what there is an app for that. 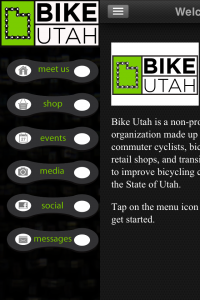 BikeUtah our state wide bicycle advocacy group has put together a great little app (iPhone and iPad for now), which ties you into all the cycling laws for Utah, different events happening around the state, as well as all of BikeUtah’s social/online communities. I like the app for how simple it is, and how quickly you can access key information and social connections to riding around. It provides a great base for any rider to learn more and get more connected on the state level. It would be really neat to see the events section expand to all cycling events around the state, and to highlight events in the exact place that you find yourself. This could be done by a city selector, or by using the location service which the app already accesses. 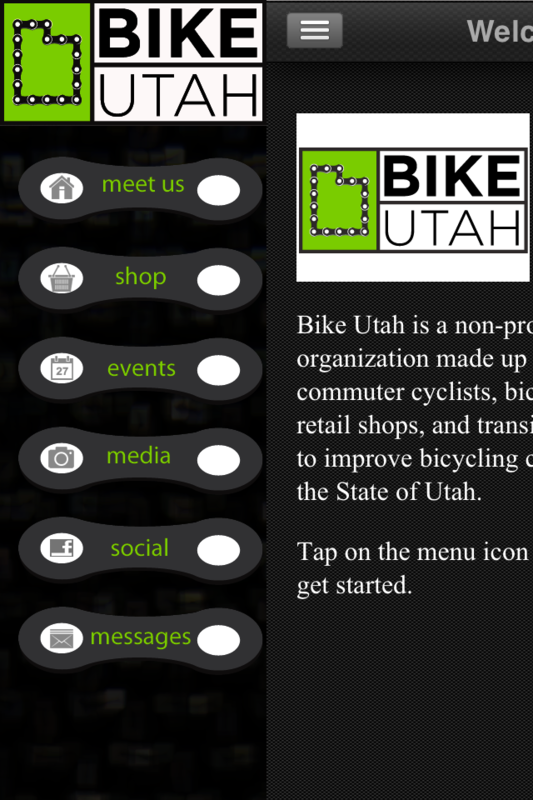 How awesome would it be to be in Moab and check out your handy BikeUtah app to connect with riders and rides there in Moab? I think it would be super awesome! Not only could we expand connections between cyclists in the state, but we could also get more people on the app more often which would keep more of us in the loop on national and state wide issues. Overall this is a great app which I recommend everyone getting. You can download the app for free at the App Store. Bike Provo rode with this race last year, and had a blast! So we are pleased to announce that the race is back up and running again. The first race of the season happened last week during Bike Week, and the next one is coming up this Friday (6/1). For those of you who have not heard of the FFUFR it is a beach cruiser/beater off road race. The race happens in the back of Paul Reams Park, and is truly built around fun. There is always a great group of riders and spectators who are always willing to talk bikes, and share a laugh. Don’t have a bike? No worries, bikes are provided for those with out. Check out the Facebook event, and the video bellow. 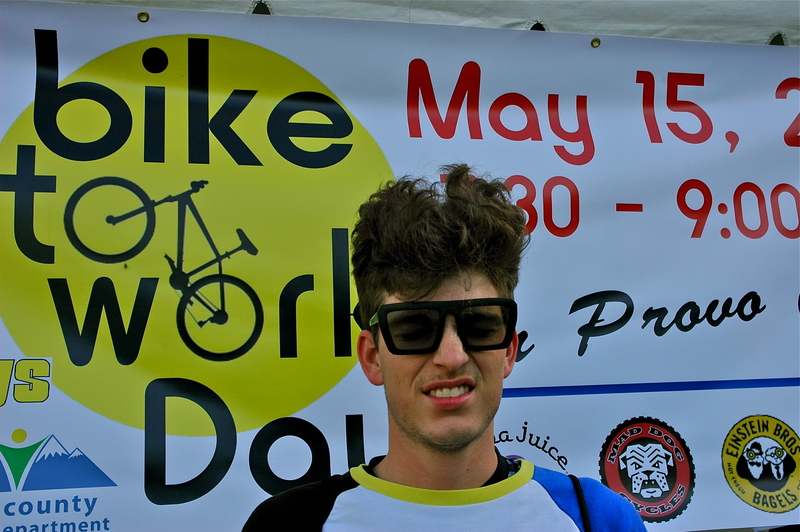 Don’t miss today’s biking events. Bike Committee Meeting (5 pm, Provo City Center council offices 351 W. Center) – Twice a month, a group of Provo bicycling advocates meets to discuss what we can do to make Provo a better place for bikes. 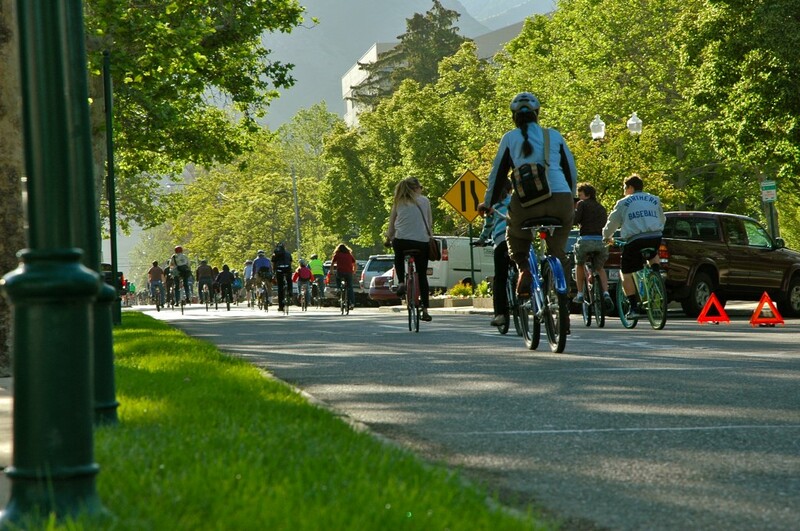 So much good has come from these meetings: complete streets policies, the current bike map in the city’s master plan, the new bike plan grant that will eventually result in new lanes throughout the entire city, year-round biking events, and more. Come join us and bring your ideas. 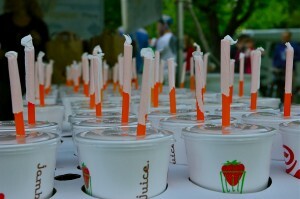 Great things are happening in Provo, and you can be a part of it! See the facebook event for additional info. 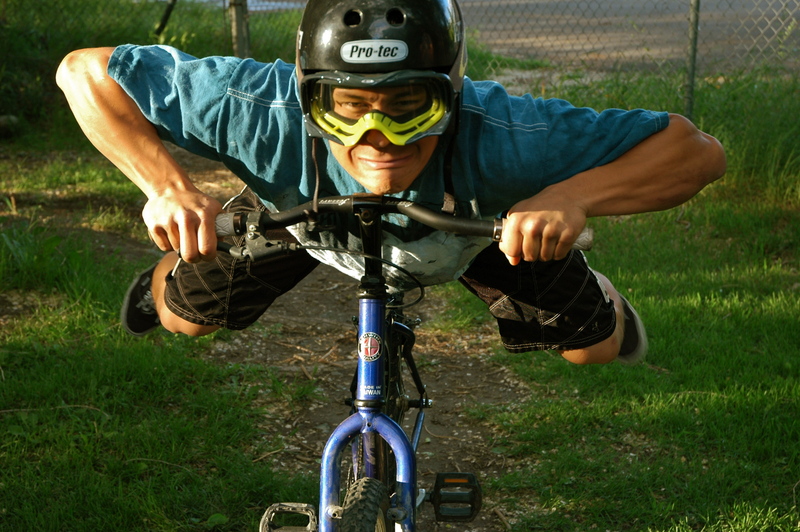 Bike-In Movie (7:30 pm, 351 e 300 s) – Ride on down for a fun night with new friends. Bring a blanket (and maybe a sweater) and your friends / family to our third-annual bike-in backyard movie. Be a part of a Provo tradition! The Provo Bicycle Committee is pleased to introduce the first ever Golden Spoke Award at this year’s Bike to Work event. 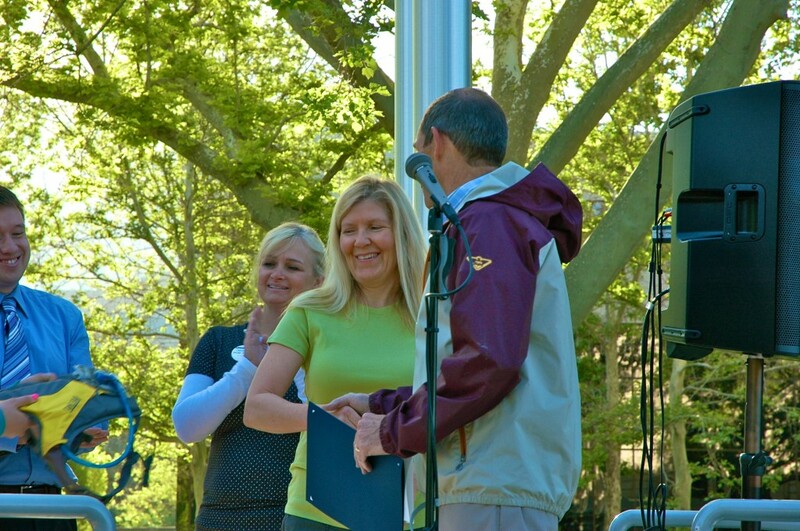 The award is presented to a Provo cyclist who exhibits a commitment to bicycling on a daily basis all year around. It is called the Golden Spoke because each bicyclist is like a spoke in a wheel that helps make Provo a more bicycle friendly community. Each of us can advocate for bikes, more bike-friendly complete streets, bike lanes, and racks, and most importantly each of us can bike wherever and whenever possible. 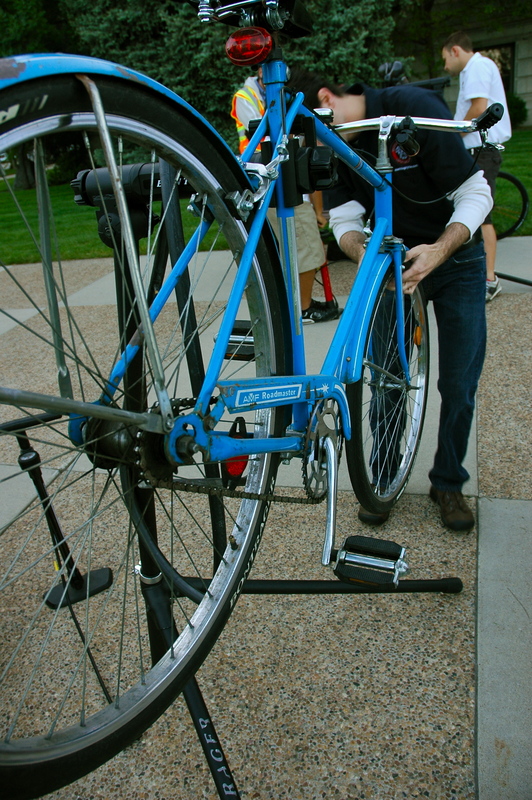 The Provo Bicycle Committee will present this award twice a year–once at this event each spring, and once in the fall at a city council meeting. Roxanne Miser finds that her 1995 Schwinn mountain bike, with a basket on the rack, gets her to most places she wants to go around the valley. Living in Provo’s Lakeside neighborhood, she makes almost daily grocery trips to Smiths for produce and other staples, and makes weekly rides out to Wal-Mart and Sunflower Market as well. She is an avid hiker and relies on her bike to get her to the various local trailheads. 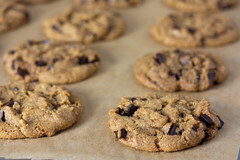 Most of us who frequent the River Trail have seen Roxanne out for rides with her husband and three blonde boys in tow, the most common destination being BYU’s Creamery. She does avoid days in which the street are icy and snowy, but otherwise rides year round, and doesn’t let a little drizzle get in the way of a grocery run. Want a discount or a free goodie from one of Provo’s best restaurants? All you have to do is ride your bike and ask for the Bike Week Discount this week only. 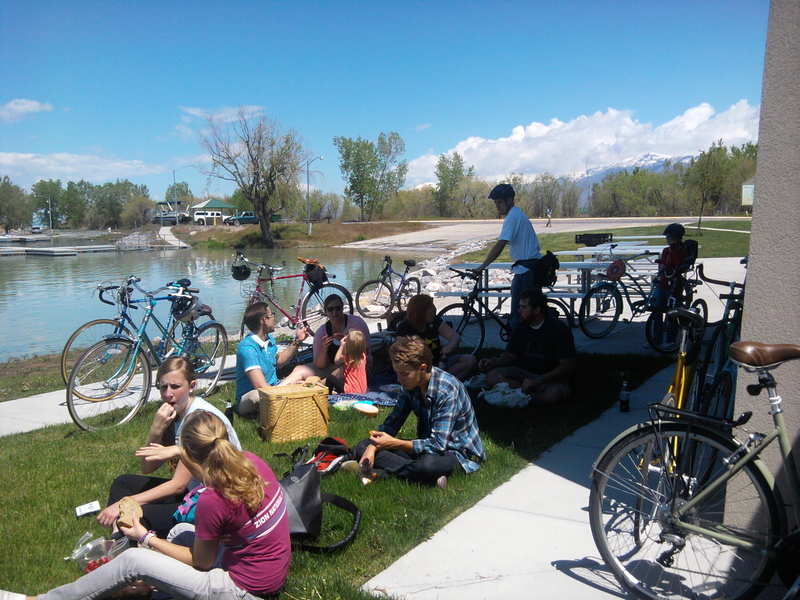 A big thanks to these Provo restaurants for supporting bikes in Provo and making our community a better place to live! 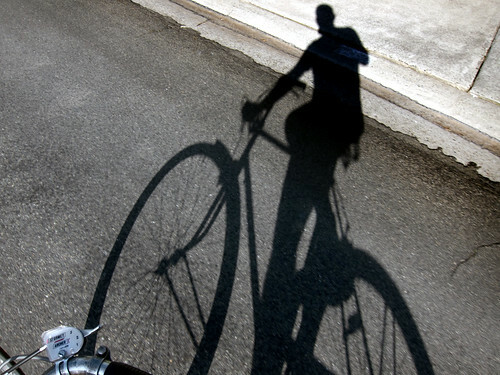 Don’t miss tonight’s Monday Night Ride. 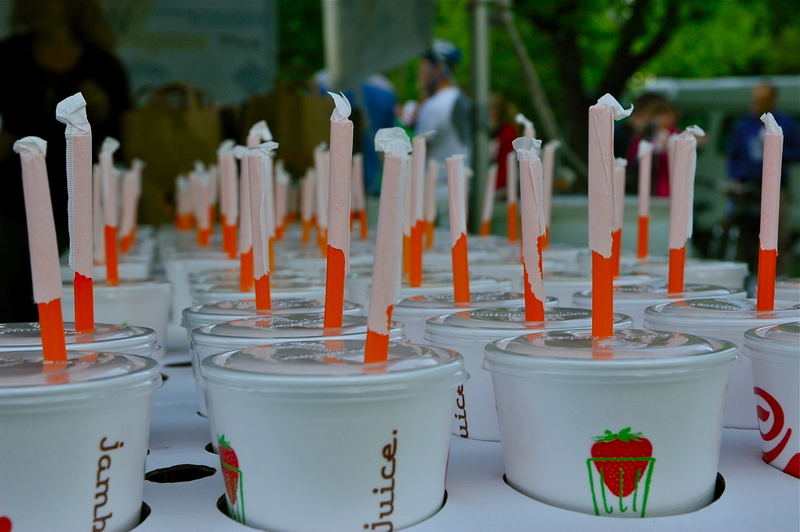 Everyone is invited to join in the revelry tonight (5/14) at 9 p.m. Meet at Joaquin Park. Join the Facebook event or join the Monday Night Rides Group for updates on all of these summer-long weekly rides.